NOTES: Here's a nice one for the kiddies or those seeking a really easy build. One of the favorites of the street rod crowd has been the 1934 Ford 3-window coupe. 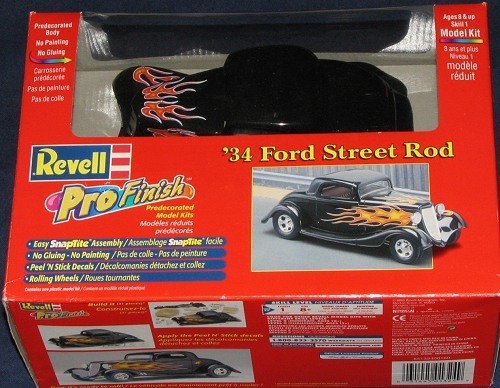 This model is more graceful than the earlier Fords and just lends itself to a chopped top and flame paint scheme. Thanks to a large network of enthusiasts, it is possible to build one of these types of cars from the ground up using new parts and fiberglass body/fender panels. Even out here in the weeds, I see this type of car every once in a while, being tooled around by its proud owner and trailed by the police who are looking for violations! As much as many modelers want to deny their existence, the truth is that when a youngster gets involved in plastic modeling nowadays, it is more than likely to be a model similar to this. I find it odd, because at the lowest age suggested on the box (8 years old), I was already assembling and painting glue kits. Dislike them or not, it is better to have kids get introduced to the hobby through this medium than not at all. The kit itself is really well done. The body and fender pieces already have the flames painted on and a high gloss provided. Not only that, but there were no mold seams evident in these two major parts so even 'serious' modelers could use these for a project. 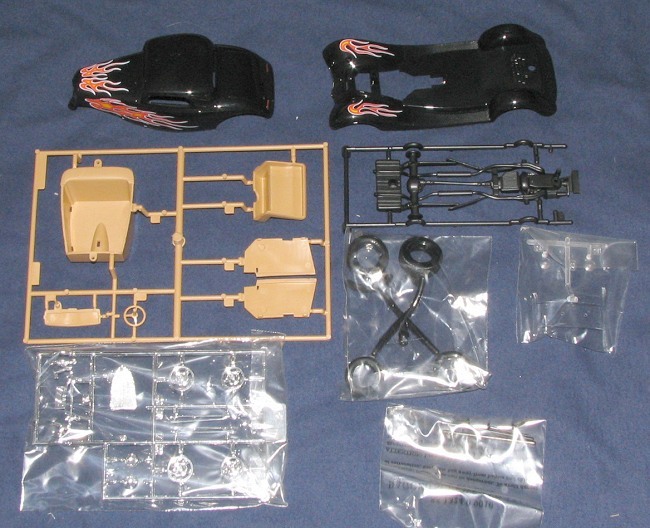 It is, of course, a curbside with the lower portion of the engine and rear suspension molded on to the chassis. A separate front suspension is provided but it really isn't that prototypical. The interior is in a tan with separate inner door pieces, bench seat, shifter, dash and steering wheel. This all fits snugly into the body shell once the very clear transparencies are fit into place. Vinyl tires are provided to slide onto chrome wheels and the snapped onto metal axles. The quality of the chrome parts is really quite good. The chassis is screwed onto the body with two screws. Instructions are very clear and straight-forward, the perfect thing for the youngster to do on their own if they so choose. 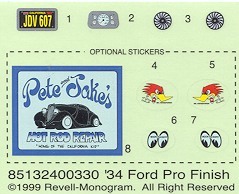 A set of stickers is included for such things as the instrument panel, door speakers and license plates. Like it or not, this is much of the state of the hobby today. Look on the shelves of any store that sells model kits and you will see a LOT of these kinds of kits in both plastic and metal. While many will poo-poo these sorts of models, they obviously have an appeal of companies wouldn't keep making them. I was quite impressed by the level of finish and detail given by this kit and can see why they'd be great for the youngsters. Heck, even some of us oldies could benefit from something like this if we are stuck on a project and just want to get something built!